12 September 2007 (Vietnam Net Bridge) – Cannon and gunpowder technology were first invented in China, which must have surely diffused towards Southeast Asia. The technology was highly improved upon by the Europeans however. The Thua Thien Hue Museum of Revolutionary History has recently received three ancient cannons considered particularly valuable by many experts. The bronze cannons weigh about 4 kg each and are of different lengths. One is 36.5 cm long and the other two are 35.5 cm long. 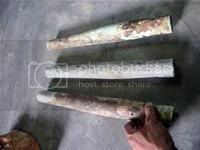 These cannons were discovered by local residents in Thanh Trung hamlet, Quang Thanh commune, Quang Dien district. This is the site of the old Hoa District Citadel where the office of local authorities was located during the Tran, Ho and Le dynasties, and thus the cannons may date back to these periods.